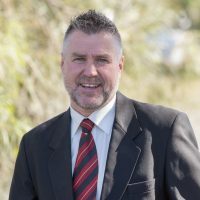 Leading Elders Mildura, Wentworth & Robinvale since 2011, Marty offers our entire team and customers the backing of over 30 years experience to achieve the best possible results in selling your property. Growing up in Mildura and living in the footsteps of his parents business “Frank Deacon’s Pharmacy” has helped Marty to understand business and in particular his loyal staff and clients who have helped over the past 30 years. Very much a family man, married to Deb for 30 years and providing for 5 wonderful daughters has been one of Marty’s many motivators for success. Marty is full of energy and will always give 100% to all that is required and his commitment to his clients and staff is second to none. Marty covers all aspects of Real Estate specialising in residential, rural, lifestyle and river front property. With many years of experience there is not much Marty cannot do. Private sales, expressions of interest, tenders or auctions, Marty will make the selling process comfortable from the minute you have your first meeting through to settlement. Marty works hard but does have interests away from work which are very centred around his family and friends. Once a successful footballer and cricketer but now days are about bike riding, collecting and restoring old vehicles, motorbikes and also long weekends to enjoy driving them. Marty is very much about repeat business and his referrals from previous and current clients, family and friends keep him very busy. Would you like to speak to Marty? If you’re thinking about renting or selling your property and you’d like a clearer picture of how much your property might be worth or want to have an informal chat about general property market trading conditions, Marty will be happy to arrange a full market appraisal of your property.